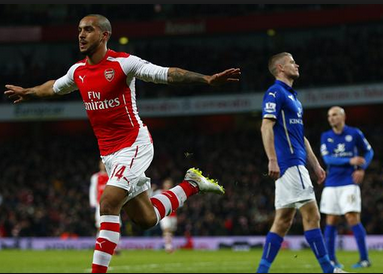 Arsenal vs Leicester match ended with 2-1 scoreline in English Premier League 2015. Goals by Laurent Koscielny and Theo Walcott helped Arsenal earn a narrow 2-1 victory over Leicester City and move back into the top four of the Barclays Premier League. Leicester City manager Nigel Pearson: "We've played very well again and I could argue we created a lot of chances but as I said, I don't want to talk in terms of us being unlucky. I want us to learn from performances like tonight and make sure from here on in if we replicate that sort of performance we still have a good chance of avoiding relegation. "It's all well and good talking about performances. It's alright looking on the bright side of life but ultimately it's about winning games and we continue to be under scrutiny because of the position we are in." Full Time Score : Arsenal 2-1 Leicester. Arsenal: Ospina (7), Bellerin (6), Mertesacker (7), Koscielny (7), Monreal (6), Coquelin (7), Rosicky (6), Walcott (7), Cazorla (7), Ozil (8), Sanchez (7). Used subs: Flamini (6), Ramsey (5), Giroud (6). Leicester City: Schwarzer (6), Simpson (6), Huth (6), Morgan (7), Upson (6), Konchesky (7), Mahrez (9), Cambiasso (7), James (6), Schlupp (7), Kramaric (8). Used subs: Ulloa (6), Wasilewski (6), Nugent (6).